If you’re reading this article it’s probably because you have never traveled anywhere with your boyfriend before, or you did, and it just didn’t work out well. First of all, you have to sit down and think about your relationship. For how long have you been dating and do you consider your relationship ready for this enormous step? If you jump it this adventure too quickly it can turn out to be a huge disaster. We will give you a few tips that will show you how to spend a nice vacation with your boyfriend. So the first advice would be: try not to rush into something you’re not prepared for. 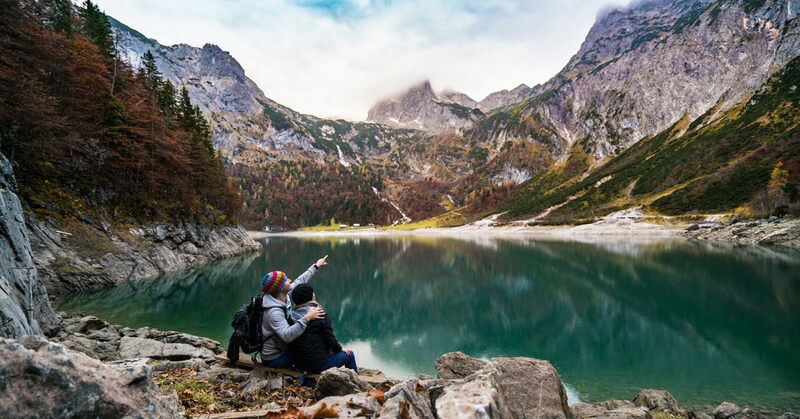 If you travel with your partner you’re going to see a lot of him, and that can be a bit of a problem when spending all the time together is totally out of your routine. Spending a weekend together can be a perfect test to see if the two of you are good traveling companions. You can take a long hike in the woods close to your town or explore other cities near yours. That should show you how you and your partner will manage in a new surrounding. If the trial-weekend went good, now you’re really ready to go to a vacation together. There are probably so many places you would want to visit with your boyfriend, but in the beginning of a relationship, you should consider going to a closer destination. If you live in Europe, summer vacation in Greece, Istanbul or Italy is totally fine, but far away destinations such as Thailand or New Zealand are probably not the best choice for a young couple. Those kinds of destinations require using multiple airlines, and that can bring some anxiety. You still don’t know your partner that well, and you cannot get away that easily if you’re thousands and thousands of miles away from home. Your dream is to visit French Riviera, but he wants to see The Great Pyramid of Giza… can you spot the problem here? The best way to solve it is by listening to each other’s wishes. Both of you can make a list with destinations you would like to see the most, and then compare those lists. In the best scenario some destinations will match, so then you can narrow down a choice to a couple of countries. When you determine which country you want to see, next step is to choose a town or some other place which will satisfy both of your needs. This is similar to the last tip. Not only you should decide specific destination together, you should also plan the whole trip. This is very important. If one partner doesn’t get to choose most or any part of the plan, high chances are that there is going to be some kind of a misunderstanding. So you should make a plan what hotel are you going to stay and how are you going to spend each day. Do a little searching on the destination, so you can see if there is something interesting there for you both, and decide when are you going to visit those places. Have a plan, but don’t stick to it like your life is depending on it. You’re so happy and excited about your vacation, and the two of you made a whole plan filled up with various activities. That’s wonderful, but you must pay attention not to overfill it. These kinds of things are happening on a daily basis not just on vacations. We make a schedule without any free time, and then we realize we are way out of the schedule, and we get frustrated. This can also happen on your first vacation with your boyfriend, and then you are forced choose on the spot what has a bigger priority, which is a road for bigger and bigger misunderstandings. You can bypass this by making a plan which includes some free time, and a time for getting lost. Talking about your incomes can be pretty awkward at the beginning of a relationship. Anyhow, you must have this unpleasant conversation if you want to take a trip with your partner. You should decide if you are going to split the budget, or one of you is going to pay more for the vacation. Maybe the difference in income for each of you is so big that one of you wants to pay for the entire vacation. If that’s the case then the other one should say if he’s okay with that. Bonus tip: set the daily budget, so none of you can spend more than you have. This especially refers to women. It’s not strange for us to over pack our bags like we are moving to another place. Then we realize we cannot bring all that stuff with us, and give our boyfriends to carry some of it. Now he is carrying his backpack and the backpack he didn’t ask for. When you’re packing take only the things you are going to need and which you cannot buy at the destination you are going. Don’t pack something you can’t actually carry on your back for a whole day. This way no one’s hands and back are going to hurt. Compromise is without any doubt a foundation of a healthy and loving relationship. It’s important for you and your partner to be able to hear each other’s wishes, not only when traveling, but always. Try to keep in mind that you’re not traveling alone and that your needs are not just yours and yours alone. There are two of you now. That means that sometimes on a vacation you have to do something you’re not thrilled about, like going to Camp Nou stadium in Barcelona, and you don’t know a thing about soccer, but your boyfriend loves it. If you need more love tips you can find them on site Youqueen.com. This can relate to the last one: just because you don’t know something doesn’t mean you shouldn’t try it. Being on a vacation with your boyfriend is a perfect opportunity to step out of your comfort zone. Maybe you like to have everything under your control, and in the daily life this trait can come as a virtue. But when the two of you are together it can ruin your trip. So, get over your fears and do something you would normally never do, and you’ll see how much you’ll like it. Spending so much time together will create an opportunity to get to know each other better. When you are with him all the time you might discover his true nature, and that can be pretty scary. He probably has some habits or behaviors you didn’t know about, and all of them will probably get noticed when you are together 24/7. This applies to you too. He will be there if you lose your cool, which can lead to a horrifying experience. However, learning about one another can make you even closer, and you can even find some of his habits quite endearing. If you don’t want any surprises we advise you to prepare question to ask a guy before the vacation. It’s fun to taste some traditional vine or craft beer, which can give you a true experience of a place where you are. But we advise you not to get drunk or to drink all the time. By doing this you won’t be able to feel or remember a place where you are or who were you with. Your partner might not like it either. You can be drunk anywhere, but you probably won’t go on a vacation in the same place every time. So try to feel it the best you can. We already talked about getting out of your comfort zone; learning new things with your partner is a part of it. It would be great if both of you try to do something you have never done before. That way you won’t feel pressure for doing something perfectly. It can be swimming with sharks, bungee jumping… if that’s too extreme you can sign up for a traditional cooking class, the two of you can learn how to make delicious Greek or Spanish meals. There are definitely going to be some moments when you won’t like his behavior or opinion. The worst thing you can do is to nag about it because it can bring to a huge fight. You should try to accept some things as they are, or you can politely tell him what bothers you. Don’t be grumpy; it’s not a time or a place for it. Spending some time alone can be a life saver when it comes to vacations with your boyfriend. It doesn’t mean you got bored of him, or that you don’t love him anymore; it just means that everybody needs to be alone from time to time. It cannot be a long time, considering you’re sharing a room and everything, but an hour or two on your own can help you to restore your energy. You can go to the beach alone in the morning while he’s still sleeping, or he can go to the store to buy some necessities while you spend a time alone in your hotel room. There is nothing more beautiful when traveling than meeting some new and interesting people. If you are both shy to start a conversation with someone you don’t know you might try to arrange a meeting with another couple through various sites on the internet. New friends can make your vacation more fun and memorable, also they can tell you about some places you would like but didn’t know about. You and your partner are not the same, and that’s great. Different personalities, traits, and characters can be really helpful in the unfamiliar environment. You’re organized, and he has a good orientation, you speak the language of a country where you’re going, and he’s a good driver – a perfect traveling match. In every relationship it’s crucial to be a team player, so gather your strengths and make your first vacation worth remembering. You’re going to get to know your partner better, that’s for sure. But probably he will be more different in some situations than you are used to. That’s totally okay. When we travel we are changing our mindset from our daily way of thinking to tourist mindset. You are interested to see and feel a place you’re going to, you want to try things that you never tried, you let yourself get lost and spent hours wandering the streets you don’t know. You’re not limited by obligations and you have all the free time in the world. That’s why you’ll probably see a better side of your partner. You will both be careless and you should enjoy in it. Tourists are having the most fun in your town because they are relaxed and don’t think about their problems at home. Traveling with your partner is a nice way to run away from daily worries. But that doesn’t mean you should avoid a discussion with a partner about your problems at any cost. Tell if something bothers you, but try to be nice to him. This tip shouldn’t be used only when you two travel together, but always. It might happen that he can have a food poisoning or have an allergic reaction to something while on vacation. In that case, you should do anything to make him feel better, just like you would do it if you are at home. Taking care of your partner is one of the best ways to show your love to him, and he will currently appreciate it. It’s more important to let one another take care of each other, don’t try to be a stubborn and independent woman if you actually cannot do something on your own. Let him help you, and help him if you think you should do it. Memories you and your boyfriend have made on your vacation are going to be with you for the rest of your life. We always somehow remember only the good things and forget about the bad ones. Best way to keep memories is by taking photos and videos. Try not to exaggerate with clicking with your camera, which can be irritating to your partner. If you are the one who doesn’t like taking photos, make a compromise and show up in some of them. I am owner of SEO agency Net Vision. If you want be on first page on google contact us.